1) What is a Gauge R&R study in MSA? → Gauge R&R study or “Gauge Repeatability and Reproducibility Study (GRR Study)” is a term which is commonly used in MSA. ➧ This is the "within appraiser" variation. (and the same characteristic) using the same gauge more than one time. ➧ The calculation is given below. ⇒ Where K1 is a constant that depends on the number of trials. ⇒ For 2 trials, K1 is 0.8862. ⇒ For 3 trials, K1 is 0.5908. ➧ This is the "between appraisers" variation. ➧ It is the variation in the average of the measurements made by the different appraisers when measuring the same characteristic on the same part. ⇒ Where K2 is a constant that depends on the number of appraisers. ⇒ For 2 appraisers, K2 is 0.7071. 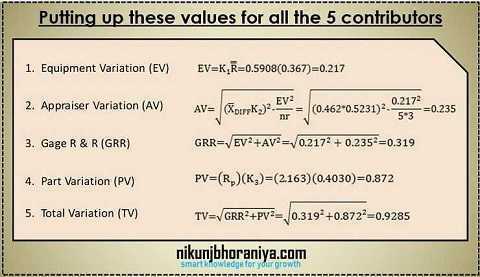 ➧ GRR is the combination of AV and EV and the calculation is given below. ➧ The part variation is determined by multiplying the range of the part averages (Rp) by a constant K3. ➧ K3 depends on the number of parts. Select 10 parts that represent the full range of long-term process variation. Identify the appraisers (inspectors or part checker). If appropriate, calibrate the gauge or verify that the last calibration date is valid. Open the Gauge R&R worksheet to record data. 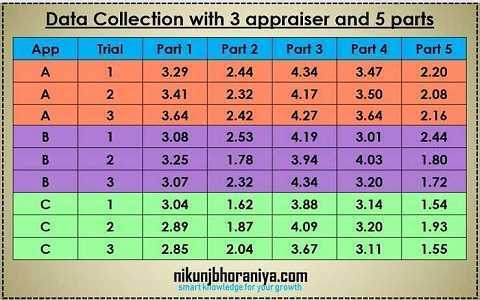 Have each appraiser assess each part 3 times (trials – first in order, second in reverse order, third random). Input data into the Gauge R&R worksheet. 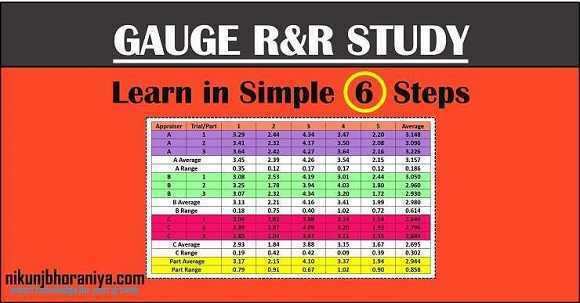 Analyze data in the Gauge R&R worksheet. Take actions for improvement if necessary. ➧ There are several issues that must be considered when planning a gauge R&R study. ➧ The first is the number of appraisers and the number of parts to use. ➧ The number of parts (n) must be greater than or equal to 5. ➧ The number of appraisers (k) must be greater than 2. ➧ The number of trials (r) must be greater than or equal to two. ➧ This represents how often each appraiser will measure a part. ➧ In addition, the n*k should be greater than 15. ➧ This gives more confidence in the results. ➧ If possible, include all the appraisers who operate the gauge in the study. ➧ The next step is selecting the parts to include in the study. ➧ The parts should be selected to reflect the range of variation in the process. ➧ In other words, don't just take 10 parts off the line right in a row. ➧ The parts must be run in random order. ➧ Start with appraiser A. Appraiser A measures the parts in random order. ➧ The results are recorded. the results from other appraisers. ➧ This cycle is continued until you have completed all trials. ➧ Be sure that an appraiser cannot see his/her results from previous trials. ➧ You select three appraisers (A, B, and C). ➧ You select five parts that represent typical variation in the length output. ➧ You have each appraiser measure each part three times. ➧ The measurement results are given below. 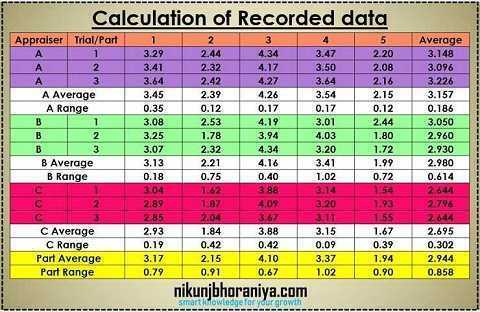 ➧ You use the above results to perform the gauge R&R calculations. ➧ These calculations are shown in the table below. → Determine the average range for the three appraisers. ➧ A has the maximum average (3.157). C has a minimum average (2.695). → Next, determine the range of the part averages (Rp). ➧ The largest part average is for Part 3 (4.10). ➧ The smallest part average is for Part 5 (1.94). ➧ Remember, a gauge R&R study is a study in variation. 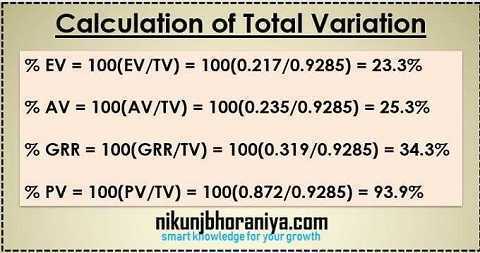 the results to Total Variation (TV). ➧ The number that most people focus on first is the % GRR. is acceptable, conditionally acceptable or not acceptable. %GRR is greater than 30%. ➧ But the study indicates that the measurement system must be improved. ➤ You can also determine the number of distinct categories (ndc) in Gauge R&R Study. ➧ This is a measure of the number of distinct categories that can be distinguished by the measurement system. ➧ It is similar to looking at how many possible values there are on a range control chart. ➧ The integer value of ndc should be greater than or equal to 5. ➧ In this case, it is 3. ➧ Again, this is an indication that the measurement system needs improvement. 4. There is excessive part variation. 1. The appraiser needs to be better trained in how to use and read the gauge instrument. 3. A fixture of some sort may be needed to help the appraiser use the gauge more consistently. ➧ Brainstorm with the team for improvement solutions. ➧ Determine the best “practical solution” (may require some experimentation). ➧ Implement the best solution – train employees. ➧ Re-run the study to verify the improvement.